Saxo Bank’s Chief Economist Steen Jakobsen is bearish on a recovery in oil prices. The Danish banker sees the growing trend in electrification, especially in transport, as a direct threat to the fossil fuel market. Jakobsen shared this prediction, along with other forecasts on global energy shifts, at a presentation for financial professionals and journalists in Moscow. “Based on electrification, and the massive amount of potential in the Middle East which is being kept in check right now because of the Saudi Aramco IPO, I think oil could easily see $25 in WTI and $30 in Brent in the next 12 months, and certainly in the next couple of years,” Jakobsen said. 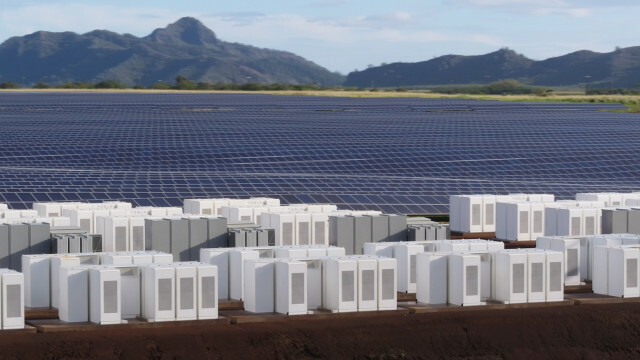 “The number of electric cars will go from 2% this year to 10% next year, and then 25% the following year,” said Jakobsen, who believes this will spell the end of oil. 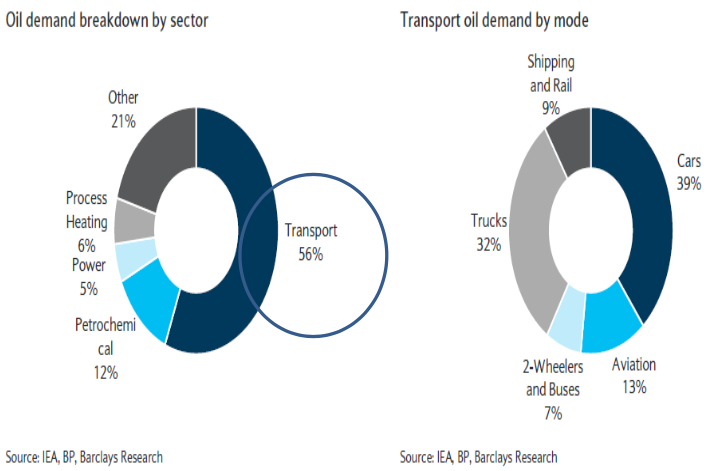 As seen in the chart below, 56% percent of oil demand comes from transport. The rationale behind the significant jump will be supported by government tax incentives encouraging citizens to buy electric instead of petrol engines. China has emerged a pioneer in using government incentives to clean up its polluted cities. In fact, China has announced that by 2030, no cars in the country will run on petrol. If production and export-based economies such as Germany don’t follow the lead in electrification, they will have major economic gaps to fill once battery-powered engines take over the traditional combustion model. Companies like Mercedes Benz, Porsche, and Audi will have to adapt to the normal of electric vehicles, and reevaluate their business models. The current streak in oil prices can be explained by supply and demand: “The inventory of oil stock in the world is going down, pushing prices up.” In the near future, when the Middle East is unable to unlock their hydrocarbon potential, this will offset the current price structure, and likely cause a glut in the market. Jakobsen’s bearish outlook on oil prices follows the theme for his other predications in the global economy, from blockchain to technology to credit availability. “Everything that goes on in the world is deflationary,” Jakobsen explained, saying that innovations such as blockchain and automatic will mean that the economy simply needs “less of everything” – fewer bankers, factory workers, and in the case of energy – less oil. This trend can be seen in the strengthening dollar: as the USD grows stronger (and thus US-held debt becomes more expensive to pay off), as a result emerging markets, commodities, and inflation all go down. In creating their economic outlooks, Saxo Bank heavily favors “credit impulse” data points, a good predictor of what the real economy will look like in nine months. The tool measures the change of new credit issued as a percentage of GDP. 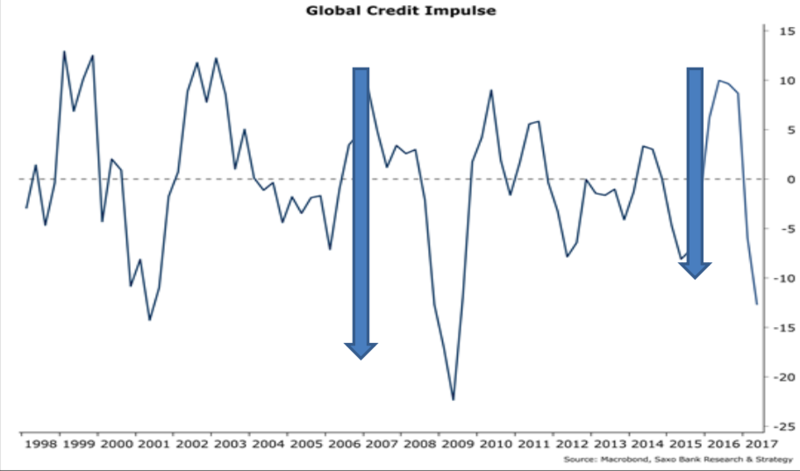 The recent drop we are seeing in the global credit impulse is the second largest in the history of this chart (which dates back to 1998). The largest decline was in 2007-2008. When faced with an equity slump in the first quarter of 2016, central banks responded with a massive amount of credit expansion, which came to fruition in the beginning of 2017. “In my opinion, there is a 66% chance probability of a recession in the early parts of 2018 in the US unless something else happens – in terms of taxes, wars, etc.,” the Saxo Bank economist said. Jakobsen noted that the drying up of capital is happening while most central bankers and politicians believe their economies are getting back on track. “The US interest rate is going to zero. There is no way the world can live with high US interest rates. It’s not only an issue for the US, but for the whole world, because 50% of all net-debt in the world is financed in dollars”. “In China, the amount of credit is still expanding, but the speed of which this credit is expanding is decreasing,” Jakobsen explained. “In Russia today you have a credit impulse contraction just as big as we see in China. If you have no lending demand, you have a low velocity of money, and low inflation.” A lack of credit in the banking sector will of course have adverse spillover effects on the economy. Under US sanctions, Russia is currently cut-off from long-term loans from US and European institutions, but has attracted credit from Chinese banks to fill the gap. However, in the long term, if Russia’s banking landscape wants to be competitive, it has to be open to foreign banks and capital. According to Jakobsen, the biggest risk to Russia right now is the US expanding sanctions to include the Russian derivative and bond markets. “It would hurt more than all the sanctions together, because you are taking away all the credit input.” If such sanctions are passed (which Jakobsen sees as likely, as Trump will want to appear tough against the Russians), the ruble could jump back up to 65 or 70 rubles per USD, and the bond spread up by 200 basis points.